Gwynn and I have been taking agility classes for the past few months. Shocking, right? I bet, based on my absenteeism in dog-post-land, you assumed I’d gotten rid of my furry buddy. Considering how remiss I’ve been in posting at all, you could also make the judgement that I’ve also gone away. Perhaps we both went ‘to the farm’. We have been doing agility, though, and, if I do say so myself, we’ve been improving at it. If any of you in the Toronto area are interested in doing some classes yourself, I highly recommend All About Dogs. They also have doggy first aid classes, rally-o, disc-dog, flyball and other classes, which I’d bet are just as good as the agility. They are all about training in steps, so that the final performance is how it should be. They are also all about making sure the dogs are enjoying themselves. Gwynn is in love with Renee. She is a fluent speaker of Dog-ish, and can do amazing things when she takes one of the dogs in the class for a demo of an exercise. 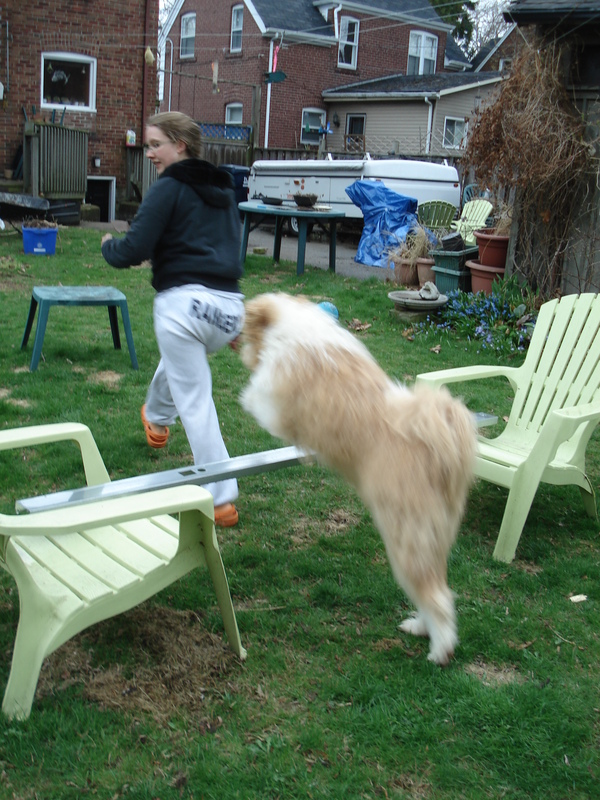 I completely believe that the levels of training in dog agility are mostly for the owner. 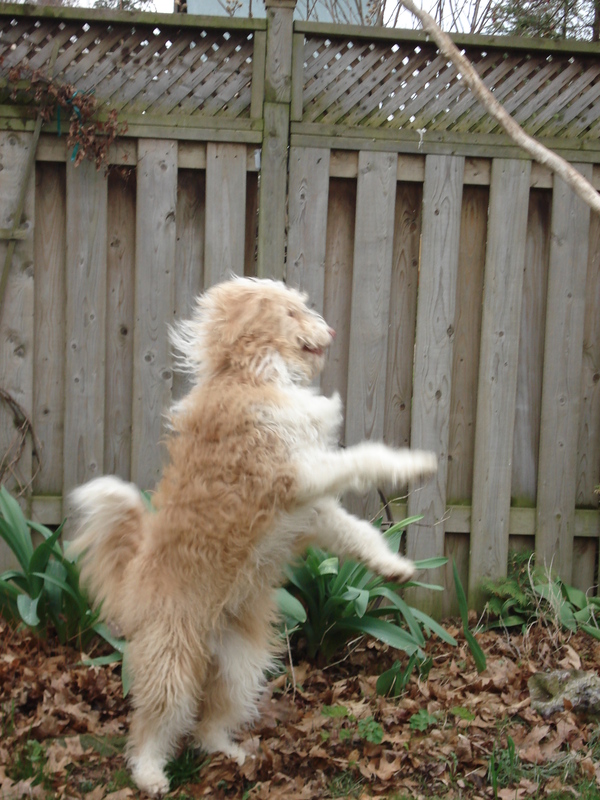 Agility is a great way of continuing your dog’s obedience training in a fun way. You might not be practicing anything very obviously command-like, but it’s in there. I’m finding that our agility training is improving things so much outside of class for Gwynn and I. He pays a lot more attention to me when he’s off-leash, his recall has improved drastically, and we are overall working better as a team. I’m learning a lot about what my body language is telling Gwynn. Very little of what I’m saying as we go through the course has any impact on what Gwynn is doing. It’s my own fault in guiding him when, despite my enthusiastic shout of “Tunnel!”, he follows me along the outside of the tunnel. In the same way, when I shout “Table” while directing him (properly)towards the tunnel, it shouldn’t come as a surprise that he does the tunnel anyways. Having a weekly class has also encouraged me to do more training at home (sorely lacking at times). We’ve been working on our tricks as well, and Gwynn, I must say, is very enthusiastic in playing dead. Not terribly good at acting… but definitely enthusiastic. You’ve never seen someone fake-get-shot and fake-die with such a huge grin on his face until you’ve seen Gwynn do it. My sister came with me to last week’s class, and videotaped some of our runs. And then, with the magic of her Mac laptop, she fancied up her videos for your enjoyment. I now have a Youtube channel. Just understand that it might be under my email, but it was set up by my sister, who took the video, laughed most of her way through the filming of it, formatted the video and posted it on Youtube for me. Pretty much the only thing I did was come up with an alternate name when it turned out the channel name “Gone for a Walk” was taken! Gwynn has decided that children are super exciting. I was walking down the sidewalk towards a woman and her son a few days ago. Loose leash, Gwynn is sniffing things and entirely indifferent to them. I moved myself and him onto the road but kept walking, so that I’m probably about 10 ft away from the sidewalk, because not everyone likes dogs and I don’t really like standing on someone’s soggy lawn in the dark while waiting for people to cross my path. Everything’s fine (why wouldn’t it be?) and then they get to be about 20 ft away from us and he lunges towards the pair (to the point that he lifts his upper body up a bit), tail wagging wildly, and woofs. Just once, but it was a big woof, not one of his sissy high-pitched ‘I see a dog’ woofs. And the poor kid bursts into tears. I apologized and got the hell out of dodge. I bit my tongue on the urge to say “It’s ok, he’s friendly!” or “He’s just really excited about kids!” or some other “I’m sorry, but here’s how we really didn’t do anything worth apologizing for” un-apology. And then it happened again, but with more barking, at some random person the next morning. And suddenly every non-dog-person absolutely needs to be greeted and he tries to drag me to them. Awesome. So – Gwynn is overreacting to the stimulus of ‘kids’, and, from what I can tell, sometimes ‘people who don’t have a dog’. And it’s like this issue appeared overnight, though I’m sure I was missing signs of impending doom. The dog didn’t wake up one morning and think to himself, “Gee, those kids… they’re so neat, I should jump at them”. After that incident, Gwynn and I spent about half an hour practicing some combination of ‘eye contact’ and ‘heel’ going up and down the busiest non-main-road in my neighbourhood. I usually just ask him for loose-leash when walking, but now I have a new goal: I want to say heel, and get him to stick close to me (preferably while giving me pretty consistent attention) when walking past people – all people. And dogs. 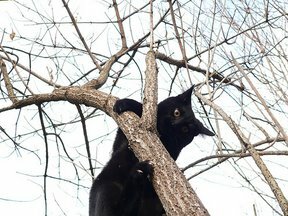 While we’re at it, let’s add cats to the list too. 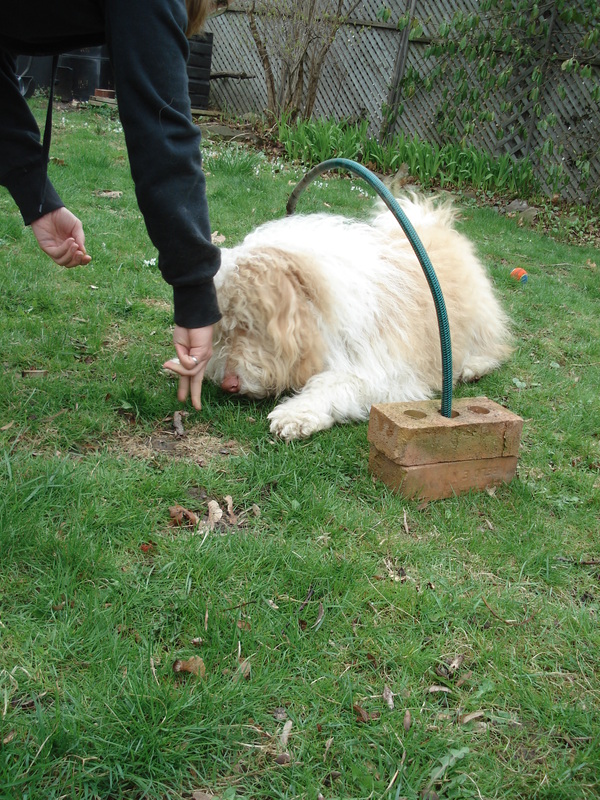 And the stump in that guy’s yard, because Gwynn acts like it’s secretly a living garden gnome every time. What I’m doing as a starting point is this: when I see people/dogs/movement on the other side of the road, I stop, get him to sit, and every time he gives me eye-contact, I reward him. I’m doing the same at intersections, and randomly on the walk. Anyone have any thoughts or opinions about this plan? Suggestions for a better plan? We had the most perfect training opportunity once this week, when we waited on the driveway for a doggy friend of ours to come up the street. She was with a trainer, and working on basically the exact same thing, so we stood on opposite sides of the street from each other, each practicing rewarding eye-contact for a few minutes. It is unlikely that I’ll find someone with a kid willing to do this, so that’s about as ideal a training situation as I can think of. Now I just need to go buy a new clicker, since I have lost a second one to the great outdoors, and muttering “YES!” to myself over and over again is making me sound like a crazy person. I have an immense amount of paranoia towards dairy. Milk, in particular… it’s the silent killer. Yogurt tends to develop green or blue spots, a sure sign that it is no longer meant to be ingested. Same with cheese (or it’s blue cheese, and meant to look like that… and I’m ok with that), and, while it is harder to notice on butter, I usually catch a whiff of that mouldy, unpleasant smell before I eat that piece of buttered toast. Milk, though… it is very hard to tell, at a glance, if it is any good. The number of times that I have gotten a half-swallow of a glass of milk down my throat before realizing that there are small lumps of milk (this is before it entirely solidifies into a chunky awful mess), or that gag-worthy sour taste… ugh. And those tiny fragments of pre-chunky-milk catch in your teeth and rinsing your mouth out doesn’t quite cut it to fully dispel the sensation. Before pouring milk on my cereal, I pour a bit into an empty bowl to check for the tell-tale signs of milk gone off. And yet, this morning, I didn’t think twice about taking my spoon out of my oatmeal, stirring my milky tea, and then continuing to eat oatmeal. possibility that I had made it through an entire mug of tea without noticing that the milk had gone chunky. Then I identified the chunks as oatmeal. Oh. My bad. On Friday, I didn’t question my parents’ decision to head up camping… on Sunday… apart from wishing that they would give a bit more of a heads-up, since fully prepping a trailer and packing it takes a fair amount of time. Despite not being in on this adventure, I was still expected to help with gathering equipment. I nodded as they said they were bringing Gwynn, and packed a duffel-bag of dog things, as well as writing out a list of important information and reviewing his obedience commands with them – practicing the ‘come’ command doesn’t stop just because I’m out of the picture for a week! Saturday night, I headed out to a bonfire party, sad at the idea that Gwynn would be gone by the time I got home in the morning, but knowing that I would only become more and more freaked out at the idea of sending him up North without me. Yes, I am ‘that’ paranoid dog owner now. 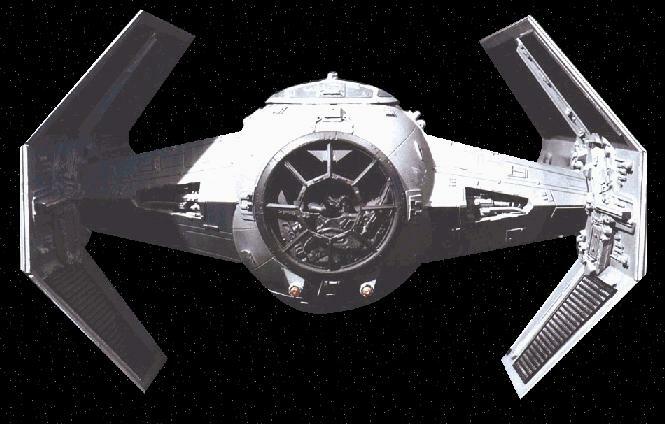 I foresee myself being more than just a helicopter-mom, when the time comes… I’ll be a TIE-Fighter mom. Timmy?! Don't touch that! let me disinfect the playground with my sanitizing-lasers and eliminate the other children before you go on the monkey-bars! Also, you've got 17.35 minutes to play, because we've got two more music lessons and a team sport to fit in before dinner. Woke up the next morning, promptly remembering that Gwynn’s last Obedience Training class of the summer term is this Tuesday. Oh well, I guess I’ll be going solo. I’d like to think I probably wouldn’t have changed the plans and kept him home, even if I had remembered the class. After all… missing a week of camping for an hour of obedience class… that’s just not right! Sunday, I realised that I hadn’t signed us up for this Monday’s Cross-fit class… luckily, their registration policy is not the same as the cancellation policy, and they’re fine with you signing up less than 12 hours before the class is set to start. This morning, I crept silently about my business, trying to avoid waking Gwynn up in my early-early morning departure. In an empty, dog-less house. I nearly snuck out the side door in my usual ninja-manner before remembering this fact. I also nearly left the house in my pyjamas. And without a top for my office-wear outfit for after the gym. That would have been an interesting one to explain. … What I’m trying to say is, sometimes there’s oatmeal in your coffee and car keys in the freezer. Just make sure you’ve changed out of your pjs before heading out the door. Especially if it automatically locks behind you. 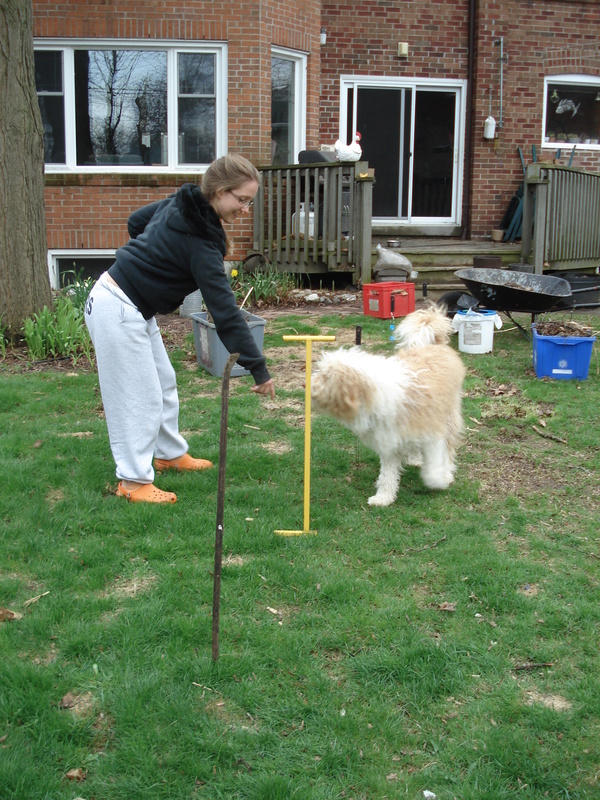 In a perfect display of slacking on yard-work, we spent one afternoon turning our yard into a personalized agility course. We took our mostly empty yard, and a variety of not-in-use bits of scrap, and turned it into our very own agility course. It is pretty epic, I know. If you ignore the fact that it looks a bit like the beginnings of a hoarder’s back-yard collection. Then again, the fact that we had so much of this stuff just lying around is probably a good indication that we have issues with throwing things away. And, of course, once we’d run through it a bunch of times, we figured we should take some pictures of Gwynn in action, and also give some ideas on things you can easily set up in your backyard, without going out and buying things. we borrowed a table as a place to hop up... this is, by far, his favourite trick. He's now jumping up on random rocks in the path, picnic tables, and anything else he can find that he can get up on. 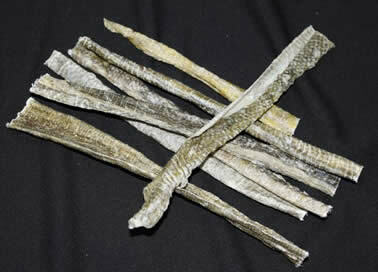 Those weaving sticks? Those are actually marshmallow sticks… and a weed pulling device… and a crowbar… The jump is lawnchairs (obviously), and a big piece of metal that mysteriously fell from the side of our house. And the hose is the closest thing we’ve got to a hula-hoop, or tunnel. The small plastic table was the equivalent of the platform a lion stands on in a circus.If you’re planning on doing something similar to this, Clementine boxes are great to start off as the supports for a jump – you can increase the height easily by adding boxes. Gwynn has already done a bit of jumping in his training classes as well as over my previous attempts at building jumps for him, so I didn’t need to start off low. 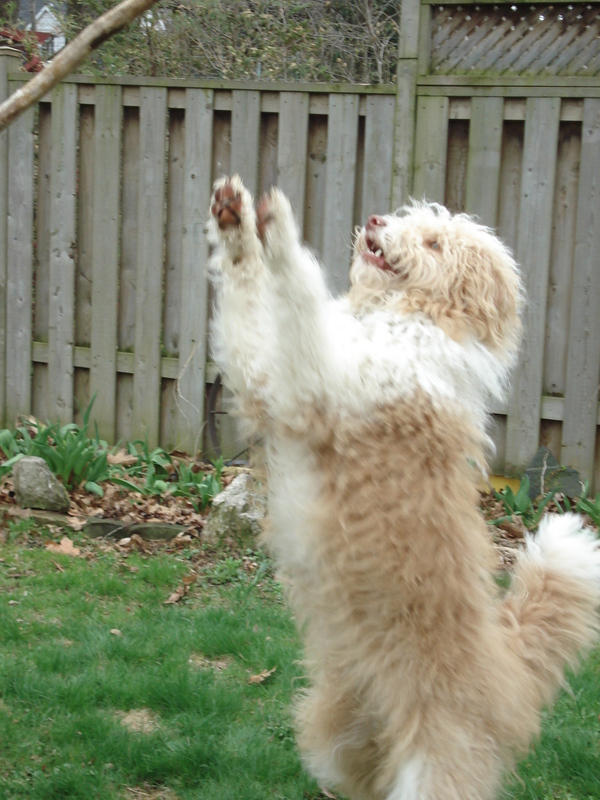 Even starting off with an upright 2×4 plank will start your dog in the idea of jumping. If you don’t have as many random poles as I do (or don’t want to poke holes in your yard), chairs, or planter pots, or anything, really, can be lined up for winding through. 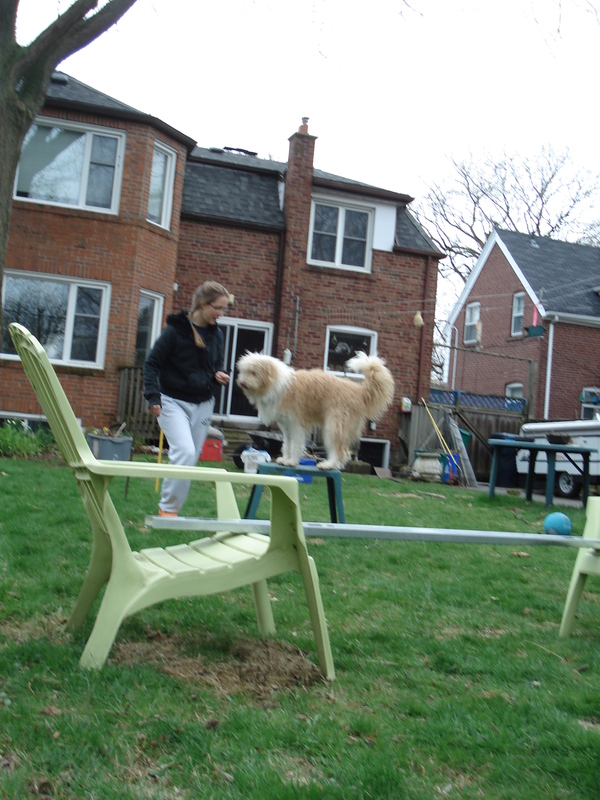 This isn’t, after all, a professional and timed agility course – this is just for a bit of fun in your own back yard. When you start off, leave a big enough gap for you to fit through, and lure your dog around the posts as you walk through them yourself. … does this remind anyone else of Calvin and Hobbes’ happy dance? Having something that your dog can crawl through is a good way to practice the crawl command, or even start it off… even if it is an old piece of hose. If you’ve got a kiddy tunnel, try bringing it out and getting your dog to go through it. I think a used kids tunnel might be my next purchase (hopeful for garage sale season! 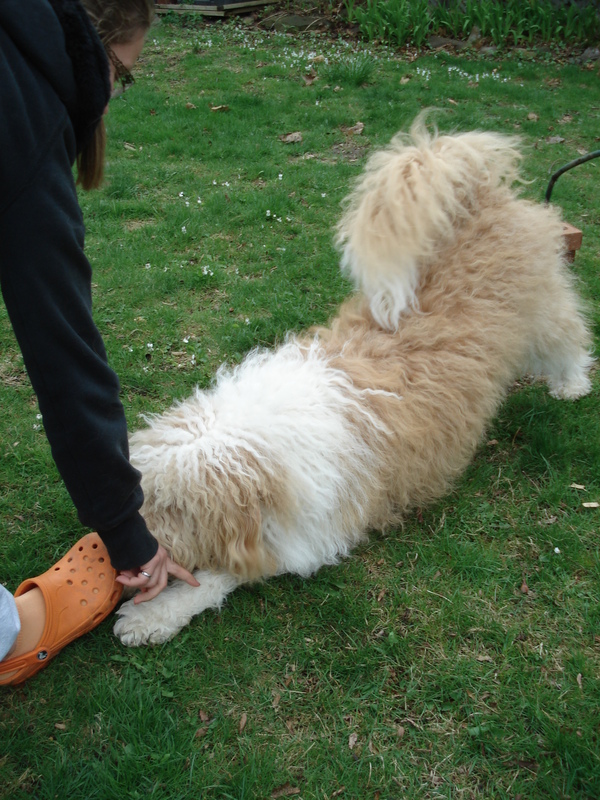 ), because that was Gwynn’s favourite thing when our trainer brought in the agility type stuff. 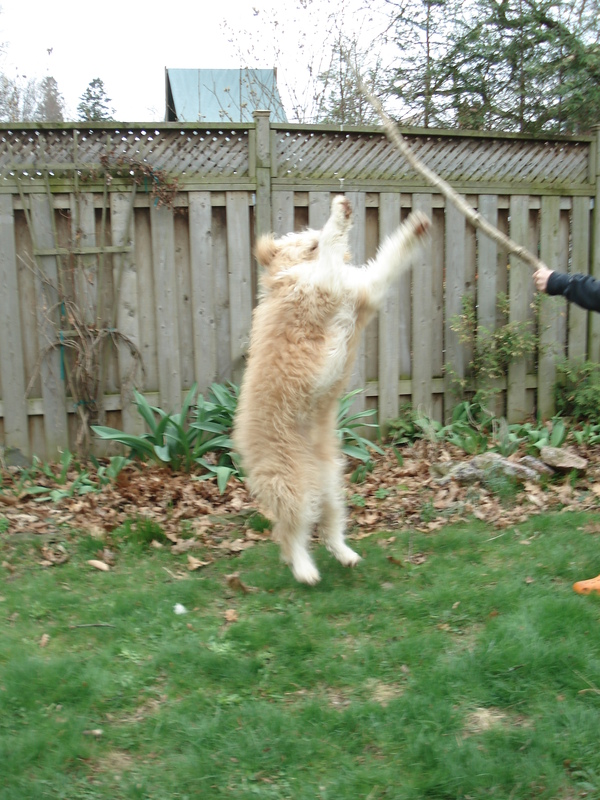 This entirely unrelated to obedience training is alot of fun, and gives you a new way to play with your dog. The other place I’ve found a use for some of his trick training is in meeting new people – it is hard to be scared of a dog that can wave at you, or bows to you. He’s charmed his way through a nursing home and a book shop with these tricks.